17 March 2015, at 2:01p.m. 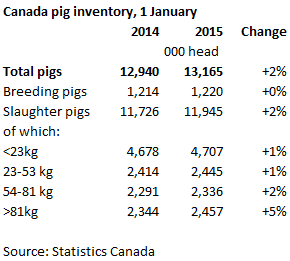 CANADA - A two per cent increase in the total number of pigs has been reported in the latest Statistics Canada livestock estimate, for January 2015, compared to a year previously. The total Canadian herd is now 13.2 million head. This increase has occurred despite some outbreaks of PEDv in 2014, demonstrating the industry coped well and the impact has been less disruptive than it was in the US and continues to be in Japan and South Korea. The breeding herd is up marginally on the year, meaning overall productivity is anticipated to grow going forward. So far this has resulted in a one per cent increase in the number of piglets on the year, despite PEDv causing a decrease in the first six months of 2014. Although slaughterings were down on the year to 20.5 million head, as more weaners were exported to the US, the number of pigs being kept for slaughter at 1 January 2015 increased by two per cent, reaching almost 12 million. Processing capacity may need investment in order to cope if such annual growth carries on and, with a five per cent increase in the heaviest pigs (over 81kgs) in January, there is an immediate likelihood of an increase in output in the short term. Note that these reported herd increases have had only a limited impact on the longer term trend of declining numbers since 2005.